Listed below are some class ideas that you may book. They are all one to one.The price will decrease if you book and pay for more than one at the same time. Contact me to arrange a time and a date. The topper is suitable for a 6 inch cake and above. 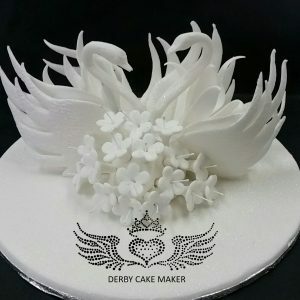 You will learn how to use the Orchard Products swan cutter and mold to make and assemble a swan along with the one I make. 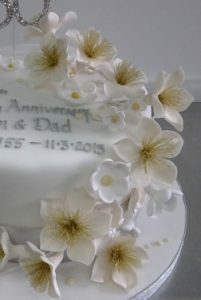 You will also make the filler flowers and take away the completed topper. 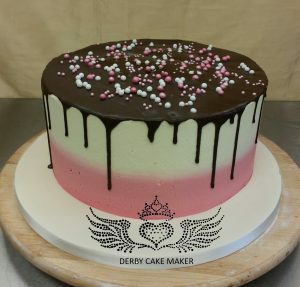 Learn how to buttercream a cake, make a ganache drip and apply. This is not as easy as it first looks but with the right guidance you will achieve great results. Bring your own sponge. Learn how to make these very versatile flowers which are easy to make.. This is an introduction to royal icing piping. Many hours of practice are required to perfect the skill. 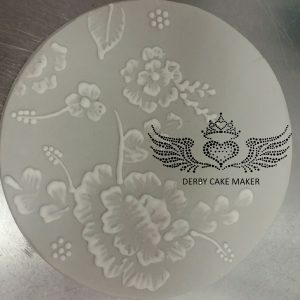 Learn how to make royal icing and how to pipe various borders using a variety of piping nozzles. You will also be introduced to a technique called brush embroidery as shown in the picture. 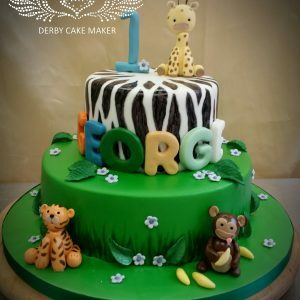 A lot of people shy away from piping but it really is one of those essential skills needed for finessing cakes. Not everyone has an aptitude for it, but you have to try it to find out. This is a one to one class. This is a must for beginners. Learn how to prep and fill your own sponges for crumb coating. Cover your cake smoothly with roll out sugarpaste and then cover the cake board. Bring 2 same size unlevelled sponges of at least 1″ depth. Everything else is provided. Learn how to make 2 animal models (or more if you purchase 3 hours). Take away your finished models.